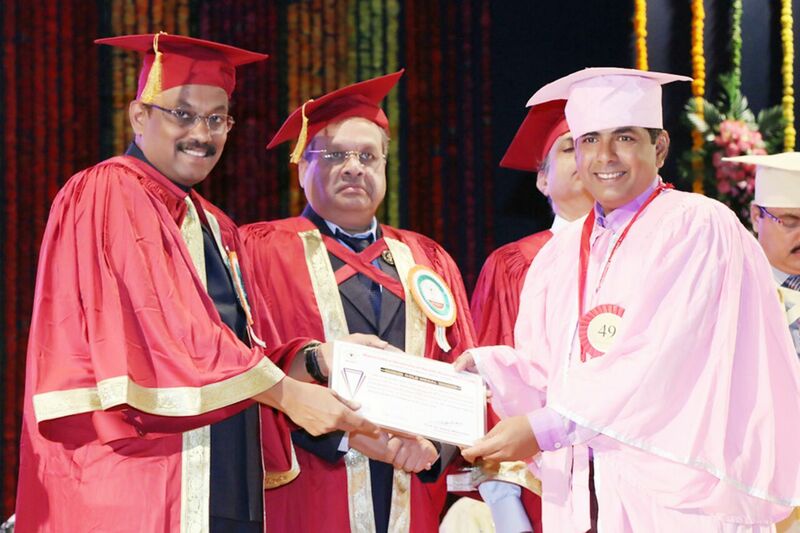 International Institute for Social and Economic Reforms (R), Bengaluru Proudly Presents Dr. APJ Abdul Kalam Lifetime Achievement National Award to Dr. Vishal N. Patil of L.R.P. Ayurvedic Medical College, Hospital, P.G. 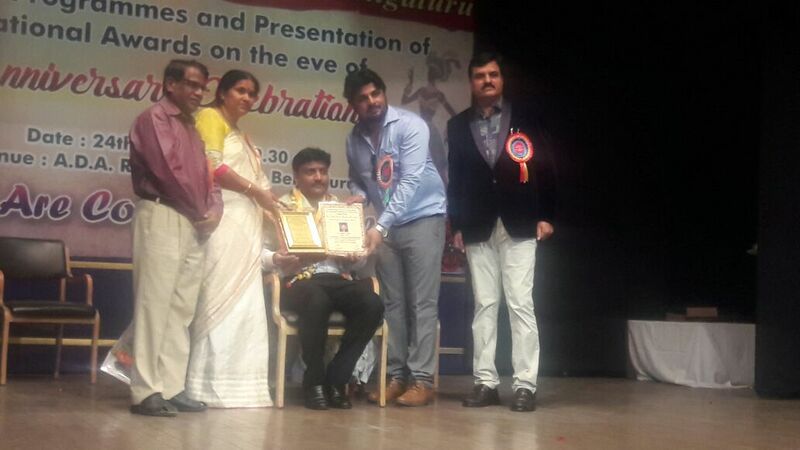 Institute & Research Centre, Islampur, Dist.-Sangli for his distinguished contribution to the development of the Nation and achieving outstanding excellence in the field of Teaching, Research and Publications on 24th Feb 2018 at Bengaluru. 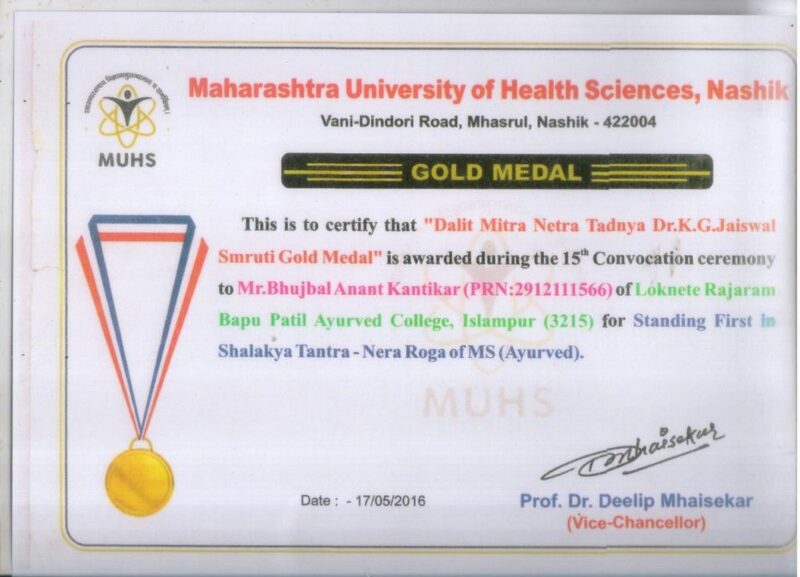 Dr. Anant Bhujbal have secured Gold medal for special Achievement as Dalit Mitra Dr.K.G.Jayaswal memorial Goldmedal. 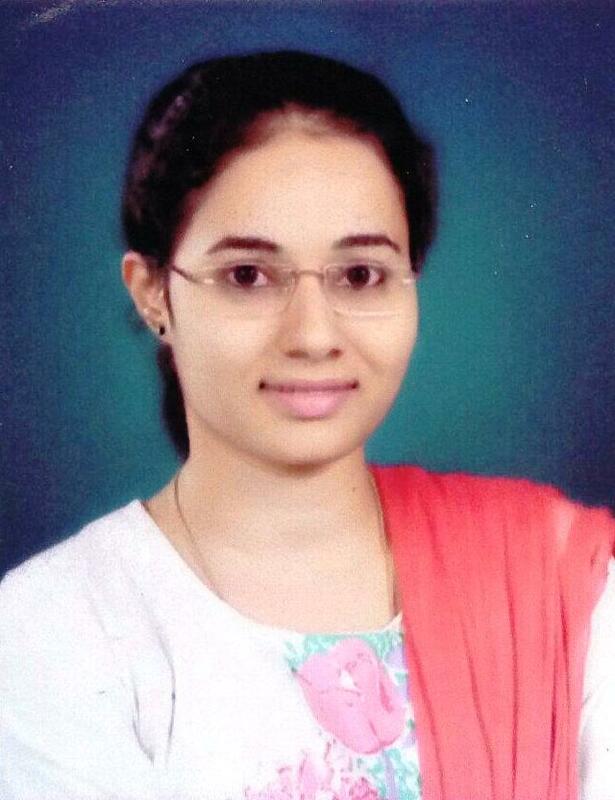 Dr. Mayuri Deshmukh & Dr. Tejashri Patil students of Loknete Rajarambapu Patil Ayuredic Medical College,Hospital, P.G. Institute & Research Center Participated in ‘Himala’ sponsored “Ayurviz 2016 National Talent Search” quiz competition & succeed to complete Intercollege level, State level,& National levels of quiz competition. Dr. Amol Yadav, Assistant Professor ( Lecturer )Dept. of Rasashatra- Bhaishajyakalpana,Loknete Rajarambapu Patil Ayurvedic Medical College, Hospital, Post Graduate Institute & Research Centre. Urun-Islampur.His paper on Pharmaceutico analytical study of Shankha Avartana(Spirelled out extension of conch) & Shankha Nabhs (Middle) core of conch has been selected for e-publication during the 5thworld AyurvedaCongress & Arogya Expo, 7-10thDecember 2012, Bhopal, Madhya Pradesh, India. 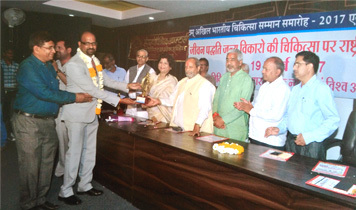 Dr. Jyotsna Murlidhar Taklikar, [ B.O.S. 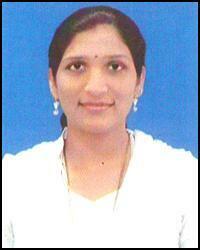 & faculty member of MUHS, Nashik (Para clinical)]Professor, HOD, Dept of Rasashastra Bhaishajyakalpana.She becomes B.O.S. member in para clinical Board & faculty member. 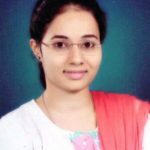 Dr. Shruti Bhokare: Best poster award in ” AHINIRVANA” – A National seminar on Agadtantra, SDM college of Ayurved, Udupi, Karnataka. 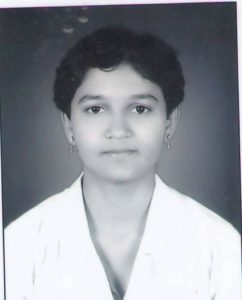 She got “ Vagbhat award ” for paper presentation in National Seminar on Raktamokashan & Virechana organized by Prabha Ayurved Foundation dated on 6&7thoct 2012 at Shirpur Dist- Dhule. Topic of paper– Pharmacokinetics of Virechana Karma. P.G. Dept.- PanchakarmaShe got “ Susruta award ” for his paper presentation National Seminar on ‘Raktamokashan & Virechana’ organized by Prabha Ayurved Foundation dated on 6&7thoct 2012 at Shirpur Dist- Dhule. Panchakarma Organised by Ayurved amrutam, Pune at Kolhapur on dated13thJan 2013. Topic of poster– Mode of Action of Virechana Karma. Our College is giving Support to students for their Sports Activities.In year 2012 our College student Miss. 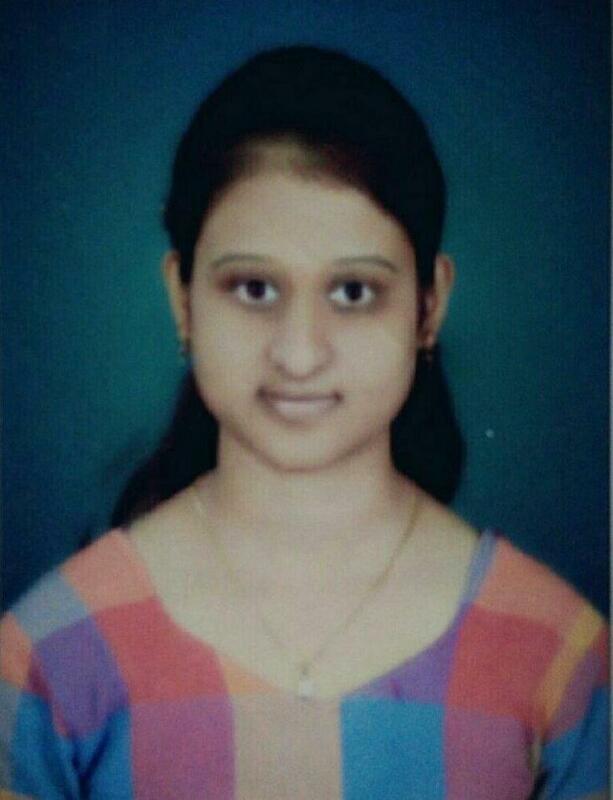 Sharayu Dadasaheb MaknikarB.A.M.S. 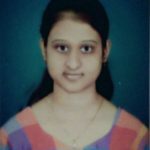 I/I was Selected as member of Maharashtra University Health Sciences,Nashik Women’s Kho Kho team for Maharashtra Ashwamedha Krida Mahotsavheld in Akola.In year Jan. 2013 again Miss. Sharayu Dadasaheb Maknikar B.A.M.S. II/II Selected as amember of Maharashtra Ashwamedha Krida Mahotsav 2013 inWomen’s Kho Kho team , Maharashtra University Health Sciences, Nashik.